Great multi-purpose outdoor-style inspired off road trail shoe combining the walkability of light hiking shoes with the performance of a MTB shoe. Glass fibre reinforced half length shank plate for optimum sole rigidity and off the bike performance. 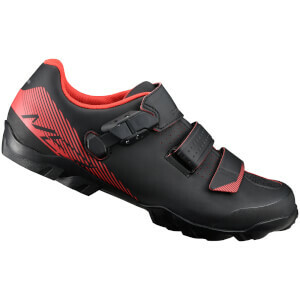 EVA midsole and rubber sole enhance pedalling efficiency, grip and walking comfort. Durable, secure fitting and light weight synthetic leather upper with rip-stop mesh for breathability.